New year. New menu. New name. 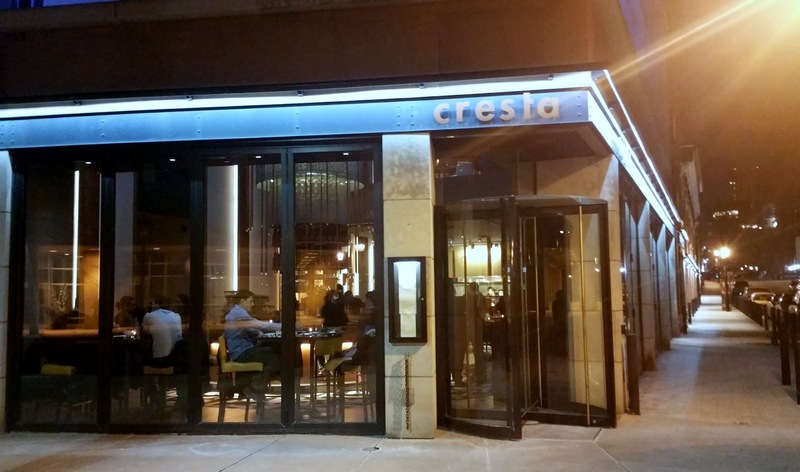 At the beginning of January, Pastizza - located on a cobblestone street adjacent to the historic St. Lawrence Market - was renamed to Cresta. I was told by Cresta's general manager, Dimitri Petropoulos, that the reason behind the change was because the owners thought the name "Pastizza" was conveying an inaccurate impression of the restaurant to Torontonians. As in, the name "Pastizza" sounded like a fast-casual Italian eatery serving only pizzas and pastas. Since that was far from the case, the owners of Pastizza decided to rename the restaurant to Cresta, after Cresta Ridge vineyard of Thomas George Estates, a California vineyard owned by Cresta's co-owner, Thomas Baker. Despite the name change and menu overhaul, the interior of Cresta (Twitter: @cresta_TO, Facebook: cresta) remained pretty much the same (I didn't see any noticeable changes anyway). Compared to Pastizza, Cresta's new menu offers a wider variety of appetizers and seafood options. The menu, overall, also carries a higher price tag than before. For example, the carbonara and lasagna I had at Pastizza were both priced at $13, whereas all the pastas at Cresta are now $20+. Another example would be the entrees; the guanciale di manzo (or braised beef) I had at Pastizza before was $25, all the mains at Cresta now are $34+. 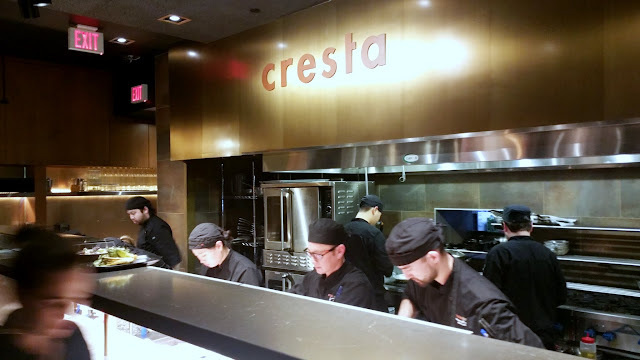 I was invited by Cresta to try their new menu. As usual, we started off with cocktails. As you may have guessed, the cocktail menu was also revamped. Beautiful presentation. I enjoyed the acidity of the citrus and the touch of coriander with the scallops. The garlic chips also added texture. We all really liked this chicken liver pate. I generally like chicken liver pate that's a touch more creamy and light (close to a mousse) but this one was very flavourful and smooth. I wish it came with more crostinis. This should be called a cheese board and not a salumi board because it had very little meat. The cheeses were also cut way too thin for my liking. I would not order this again. Delicious. That balsamic glaze was everything. I loved how the brussels sprouts were so charred and crispy. I could've easily had three bowls by myself. Speaking of which, this was a pretty skimpy portion for $10. Really lovely beets, but again, wish there was more of it for $9. Pick your poison. Different oils with various heat levels for our pizzas. Great pie with a generous amount of toppings. The crust was light and slightly chewy (my favourite kind of crust). This mushroom pizza was one of our favourite, if not the favourite, dish of the evening. Excellent toppings but the weight and moisture from the ingredients made the bottom of the pizza soft and soggy. I couldn't even lift up a slice from the plate; everything beyond the edge would droop down. Square-cut sheets of al dente pasta with pieces of rabbit, cipollini onions and mushrooms. Because of the rich and flavourful sauce this was my favourite pasta out of the three. As for the rabbit, I personally prefer it braised because I find braised rabbit a bit more tender than if it's just cooked like this. I enjoyed both the deeply flavoured and tender duck meat and the chitarra (a pasta I love but don't see often). However, I wish they were mixed together instead of plated separately like this. The pasta was flavourless by itself and with the long, narrow plate it wasn't the easiest to mix everything together; I felt like I had to continuously push food from left to right, right to left, just for that perfect bite..The meat-to-pasta ratio was also off - there was way more meat than pasta. Call me boring but I prefer my pasta plated the traditional way. "Whoaaaaaa" was my reaction when this came to the table. What a show-stopper! I haven't seen nor tried lobster pasta served this way before. The lobster tail was cooked perfectly; the meat was "bouncy" - not soft or spongy, and not tough or overcooked. The spaghetti had some lobster flavour to it so even though the two components weren't mixed together it was still good. I would recommend this dish if you love lobster but not if you're looking for an amazing pasta. This was way too sweet for my taste. The poached apple and gelato was nice but the pool of "sweetness" that the apple was sitting in was way too much. This dessert came highly recommended by our server and he was right, the chocolate truffles were absolutely fantastic. I fell into a swoon after my first bite. This saffron rice pudding ranks right up there with the chocolate truffle. It had just the right amount of sweetness and saffron flavour, one that was not too strong or subtle. Both the coconut and the meringue provided nice texture contrast to the pudding. Dab a bit of that mango coulis and you'd be surprised that not only does it match in colour, it also compliments the saffron quite well. I love sticky toffee puddings so I was really looking forward to this one but sadly, I had to stop after the first bite. Much like the poached apple crumble this was way too sweet for me. The cake itself was actually alright but it was the sauce underneath that made the entire dessert too sweet (the bottom of the cake soaked in a lot of that syrup). It is unfortunate because I did enjoy the hint of amaretto in there. In all honesty, I prefer the Pastizza menu over this new one at Cresta. I feel that the previous menu was a lot more approachable and affordable. I also miss Pastizza's carbonara, lasagna and desserts.